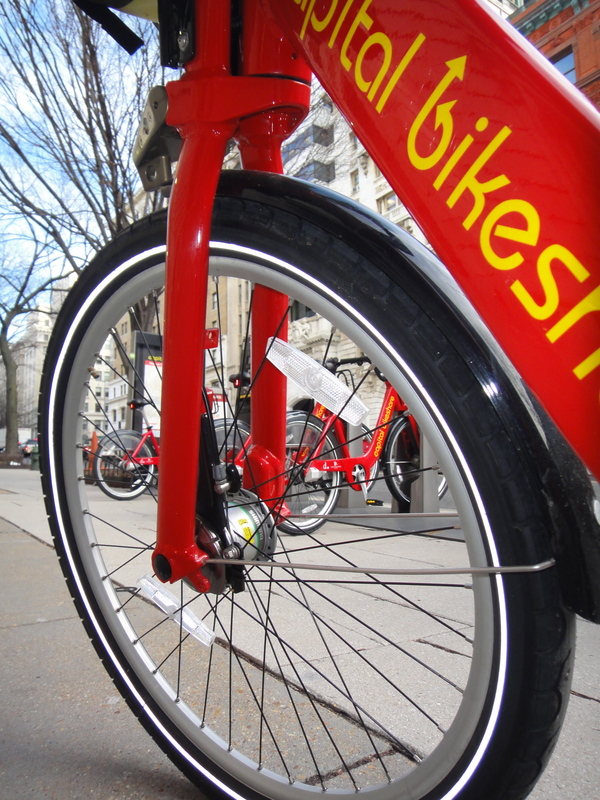 If you haven’t figured it out by now, I am a big fan of Capital Bikeshare. It’s a great way to travel around town. Bike riding outdoors in the city on a bike you don’t have to clean or maintain. I love it! Be aware of ice and other slippery spots. I think this list is a good start, but there are a couple of additions that I would make to prepare for a Bikeshare ride. 1. Bikes get wet sitting out in the elements. A dusting of snow or an afternoon of rain means a wet bike for you when you go to retrieve your CaBi Bike. Nobody I know wants to ride on a wet saddle. Carry a plastic bag with a rag in it. That way, you can wipe off the saddle and any other wet parts (like the handlebars). When you finish, throw the rag into your plastic bag so it doesn’t get anything else you’re carrying wet. 2. Even though Bikeshare bikes come with a generator hub for the headlight and rear brake lights, I like to have an extra bit of illumination. I’ve noticed that the CaBi headlights are also not that bright. They are designed more with the idea of being seen by drivers than they are for seeing the road. In addition, many drivers are just not aware of cyclists (regardless of the time of day). The darkness makes me even less sure about their awareness of me. The brighter I am, the better I feel about being on the road. Carry an extra safety light to attach to your bag. I use a running light that easily clips onto my bag. It’s nice and bright. Wear a reflective vest or sash. Yes, I know it’s nerdy, but you really do show up better to others on the road. It’s nerdy and safe :). If you really want additional front illumination, attach a helmet light. This is on my to-do list. 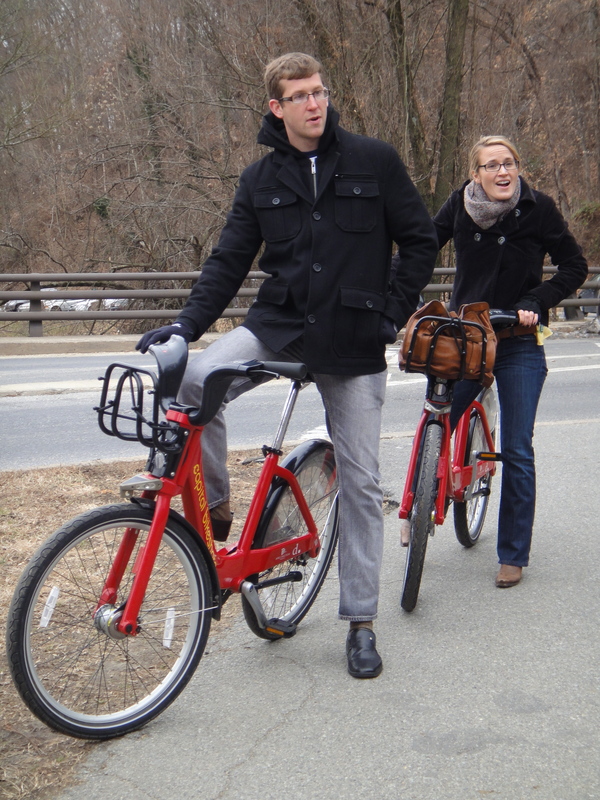 I got the idea from seeing another CaBi commuter using one. LED helmet lights are fairly inexpensive and some of them cast quite a strong light. Yes, this one is also nerdy, but a helmet light enhances your ability to see the road and to be seen by other drivers. It’s ok to be nerdy and visible! Really, it is! CaBi transportation is great because CaBi maintains the bikes and carrying around tools or a patch kit is unnecessary. My CaBi experience is made even better when I make sure to carry a few extra CaBi-specific items. Is there anything else you use to prep for your CaBi commute? I’d love to know about it!